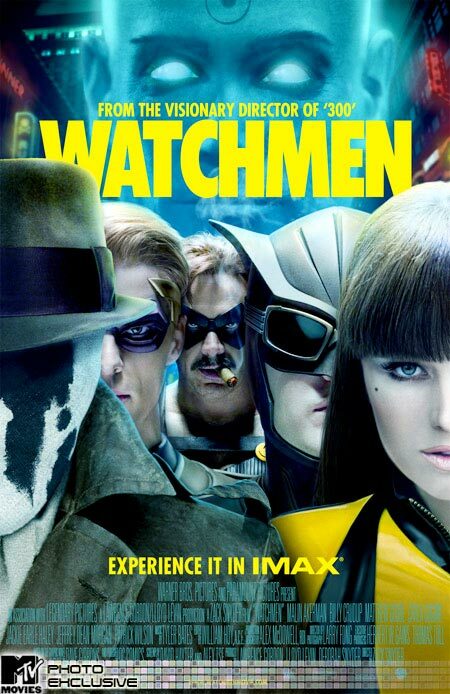 Found this poster, been writing about Watchmen a lot over at Your Comic Relief. Not one, but two posts in the past two days. The first post is what I found positive about it, and the second is what others found to be negative about it. I am particularly proud of the second post, and I think you should check it out. Possibly another one tomorrow with some art/pictures, and then a fourth in the future maybe there or here about the Watchmen game for the 360. I know everyone always says "Don't write posts about not having posted in a while." Well f that, I'm going to do what I want. I've been ridiculously busy these past months. Applying to graduate school, accepting to graduate school (! ), coaching two teams to the state championships, and having one win, planning a trip to Las Vegas, having a birthday, working a crappy job, quitting that job today. All in all, I've had my hands more than full. I would like to talk about a few of these subjects, possibly over the course of a few posts. Applying to graduate school was not a last minute decision, but a last minute action. I got most of my applications out just before the last deadline (of February 1st), and waited. First (and so far only) to respond was University of Maryland, Baltimore, which was the top school that I applied to by the numbers. I went, interviewed, and was accepted one week later. Probably much less stressful than many other people's application processes. Let me tell you about some of the other schools I applied to however. University of Delaware has requested my personal statement three times, my application fee, my transcript, and a recommendation a second. As I'm sure you can guess, they've been taken off my list. I applied to Seton Hall just in case I got in nowhere else (no offense to Seton Hall as a school, I love the Pirates, but their graduate chemistry program is a little small). UMass spurned me from the beginning, and Case Western is being slow. All in all, I got in my top choice school! Sweet. That's about it for now, I have much to talk about over the next few days of semi-unemployment. I would like to wish everyone a happy Thanksgiving. Your Comic Relief has a comic related thanksgiving post up. I'm going to be taking the rest of the day off after writing that though. Tomorrow though I plan to take on Darren Rowse, the problogger himself, so make sure to check back. Blogging is something I that enjoy quite a bit. I don't make money from it, nor do I intend to; I know those Adsense banners are up there, but they function as more of a real-time google analytics for me rather than a functional money source. I run three blogs currently, although I have tried getting into a number of topics. Right now I run Your Comic Relief and Online Fencing Coach in addition to this one. In the past I have had a haphazard approcach to updating, a few here, a few there, nothing really regular. This one has been the least regular of all, and I simply put stuff up here when it strikes me, although I have resolved to update this more as well. I read several blogs about blogging, the most prominant of them being Problogger. In the past I have had an inconsistant update schedule because of college etc, I'd get swamped, and get behind on updating or reading comics (the source material for Your Comic Relief), and then abandon the whole idea alltogether for some period of time before picking it up again. However, now with a job I'm starting to update with a greater frequency, although, as I work two jobs, one at a flower shop, and the other coaching fencing (and I'm going to start volunteer coaching at a high school in the near future as well), I generally get home around 10:30, write some posts, and then crash. The message here is that, while I have a less variability from day to day, I also seem to have more work every day, and blogging has become something of a release. Generally during the day I end up communicating to the outside world via Twitter. I've had that floating around in my head today, and it feels good to get it down on 'paper.' Hopefully I won't get too burned out with the blogging anytime soon.